On September 6, 2017, the Federal Reserve issued Strategies for Improving the U.S. Payment System: Federal Reserve Next Steps in the Payments Improvement Journey (09/06/17, PDF). The paper reflects the Federal Reserve’s plans for near-term collaboration with the industry to move closer to achieving the desired outcomes articulated in the Strategies paper. Following the release of the paper, we hosted a number of educational events including a webinar series featuring Federal Reserve leaders expanding on the Next Steps paper. Whether you missed the webinar and would like to view it for the first time or just want a refresher, you can now view the recording on demand. Join Dave Sapenaro, First Vice President and Chief Operating Officer of the St. Louis Federal Reserve and Federal Reserve System Payments Strategy Director, and Connie Theien, Senior Vice President and Director of the Federal Reserve System Payments Industry Relations Program, as they discuss the Next Steps paper and answer questions from attendees. As part of the discussion they outlined the Fed’s updated strategies to enhance the speed, safety and efficiency of the payment system from end to end through industry engagement and collaboration. Looking for more educational payments content? Check out our YouTube channel (Off-site) now. Remote payments in 2016 represented 22.2 percent of all general-purpose credit and prepaid debit card payments, up 1.5 percentage points from an estimated 20.7 percent in 2015. Learn more by reading the press release in its entirety or check out the full version of the report (Off-site). Mark your calendar to join Kansas City Fed President Esther George and Federal Reserve Board Governor Jay Powell on Thursday, September 21, for a webcast at 11:00 a.m. ET. They will share views on the Federal Reserve’s plans for near-term collaboration with the industry to move closer to achieving the desired outcomes articulated in the Strategies paper. If you haven’t done so already, read the Strategies for Improving the U.S. Payment System: Federal Reserve Next Steps in the Payments Improvement Journey, a series of refreshed strategies and tactics the Federal Reserve will employ, in collaboration with industry, to make further progress toward an improved U.S. payment system. If you’d like to learn more, review the Implementation Updates on The Fed’s Resource Center for Adoption of ISO 20022 for Wire Transfers and ACH Payments. Ready for faster payments? The Faster Payments Task Force sure is! The past few weeks we have been highlighting all the great work of the task force over the past two years, in anticipation of the release of part two of their final report – The U.S. Path to Faster Payments: A Call to Action. As for your ‘call to action’? Tune in on Friday, July 21 for the official release of the report via a live broadcast program. 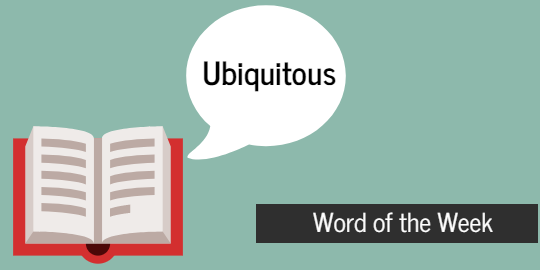 In the meantime, get ready for faster payments by following our posts all week, starting with the ‘Word of the Week’ below. 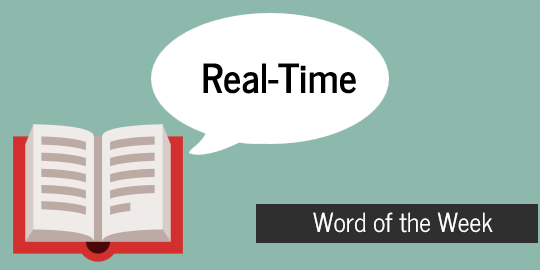 A word that gets frequent use both on this site and throughout the payments industry is “real-time.” Whenever you read about payments improvement, chances are you’ll find “real-time” mentioned somewhere in the text. But you might be surprised to learn what it actually means in the context of payments, and to understand if faster payments and real-time payments are the same thing? In relation to payments, the task forces defined real-time as “immediate/without delay.” If a friend sends you a payment via their smartphone, the money is available to you immediately. Since our current payment system does not easily support immediate payments, a shift to real-time capabilities would indeed make payments faster. Be sure to keep this in mind while you’re reading Final Report Part Two on July 21. Visit the Glossary of Terms to learn more task force vernacular. Making a payment involves much more than just swiping/inserting your card or tapping your smartphone. Did you realize there are numerous phases or combinations of phases taking place behind the scenes? The release of The U.S. Path to Faster Payments, Final Report Part One: The Faster Payments Task Force Approach highlighted how payments are processed in the U.S. payment landscape. With the Final Report Part Two just around the corner, it’s important to develop a basic understanding of payments. We’re here to help! 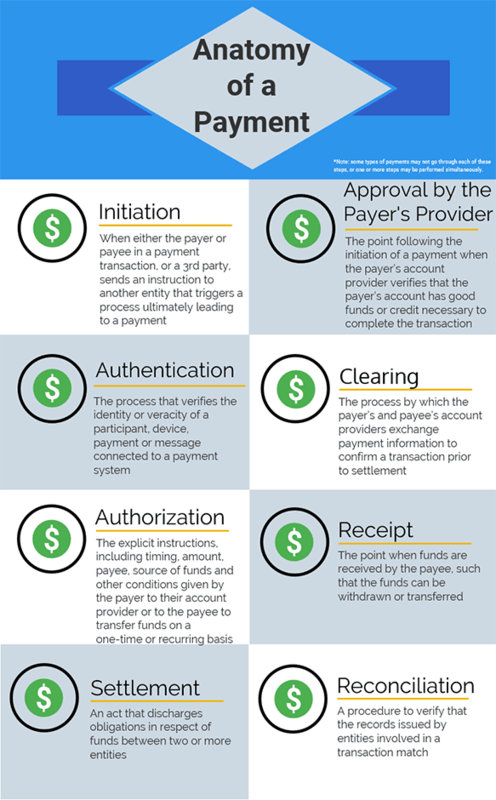 Learn about the full anatomy of a payment with this handy infographic and read the Final Report Part One! The ISO® 20022 messaging format drives interoperability by providing a harmonized set of XML messaging standards based on a shared data dictionary and business process model. The use of this messaging format enables a single, common “language” for global financial communications. In other words, XML acts like an interpreter of languages but applies that concept to financial data rather than conversations. To get familiar with payment terms commonly used by the task force before the release of the Final Report Part Two, check out our Task Force Glossary of Terms. * As defined by the Bank for International Settlements (BIS) Glossary. In order to achieve its objective of identifying effective faster payments capabilities, the Faster Payments Task Force had to define what was necessary to achieve an effective real-time payment system. What would this look like and how would you know it if you saw it? The over 300 stakeholders on the task force worked tirelessly to develop the Faster Payments Effectiveness Criteria, which is both a description of stakeholder needs that can be used to assess faster payments solutions and also a guide for innovation in the payments industry. 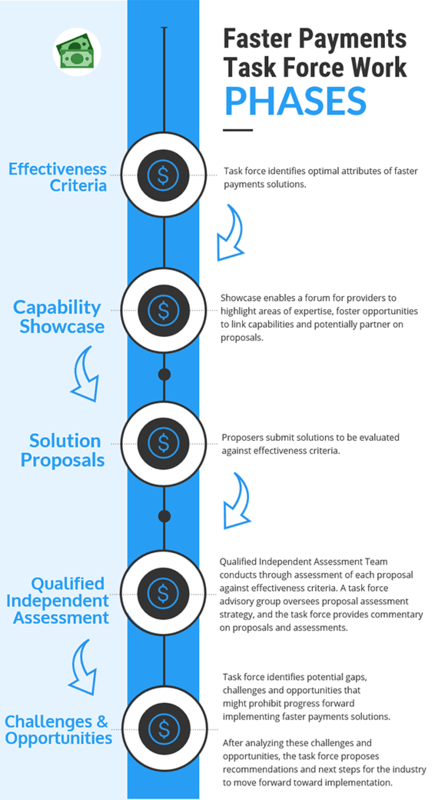 As we move closer to the release of Final Report Part Two later this month, review these foundational Effectiveness Criteria, inclusive of six categories and 36 overall criteria critical for a real-time payment system. When the Faster Payments Task Force first began their work to identify and assess alternative approaches for implementing safe, ubiquitous, faster payments capabilities in the United States they realized early on: words matter. That mantra has stuck with them throughout the two years of collaboration and work products, manifesting into the Task Force Glossary of Terms. In the time leading up to, and following, the release of Final Report Part Two we’ll be highlighting some of the glossary terms to level-set your understanding or their use throughout the report. Bob and Jane went to dinner at a restaurant that does not allow split checks, so Jane paid for them both. Bob, who is a customer of Financial Institution A, wants to pay Jill, who is a customer of Financial Institution B, for his half of the bill. In a ubiquitous payment system, the fact that they each bank with a different institution does not matter because both Bob and Jane are able to make payments that can reach any entity. You had a mobile pet grooming service come to your house to give your dog a haircut and bath. When it comes time to pay, you find out that the groomer only receives payments from the BizPay* smartphone app, while you use the PayBuddy* smartphone app. This would not be an issue in a ubiquitous payment system because you would be able to make and receive payments between all types of payment apps. For more information on commonly used payment terms, and to brush up on task force lingo before the release of the Final Report Part Two in late July, check out our Task Force Glossary of Terms.